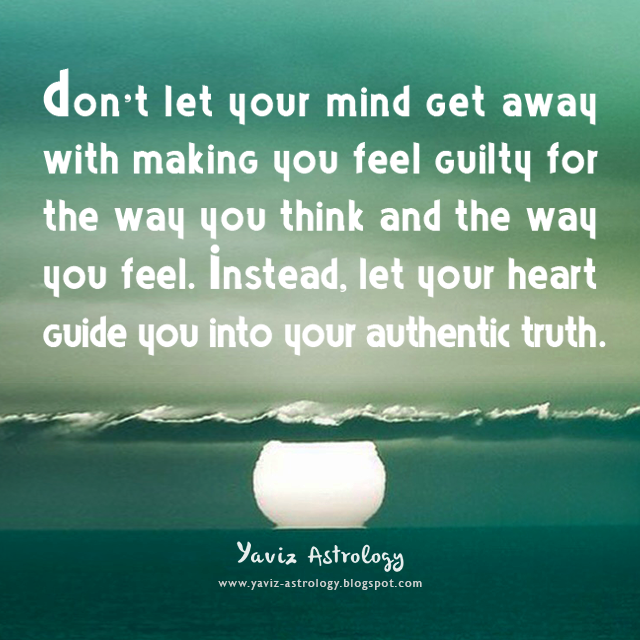 Don't let your mind get away with making you feel guilty for the way you think and the way you feel. Instead, let your heart guide you into your authentic truth. There are moments we find in life when we feel like we are stuck, or don't know where to go. These are the perfect moments to pause, to reflect, and to ask ourself; What do I really want - deep down? What do I really want to share, or express? What do I really want to achieve? Perhaps it's letting go of the past? Or starting something new? Or perhaps it's sharing something that we haven't been able to express for a very long time? No matter what the problem may be — when the mind is blocked, go where the heart wants to go, and then see where it leads. It may take us to places that we haven't thought of before. The Moon is back in her home sign of Cancer, and intuition is our most trusted friend. With the Moon's sextile to Venus and the trine to Neptune and Mercury, it's a happy time of family get-togethers and romantic outings where moonlight walks and shooting stars could paint deep memories in our heart. Friendships will bring in a lot of healing, as we could allow ourself to be taken into other worlds through dreams and conversations. The Moon is also forming a square to the Sun, Uranus, Mars and an opposition to Pluto, making this a good time to make those changes in our home or work area. Some emotional events may get us involved in awkward situations, but looking at things from a different perspective will certainly help. Set our sights high and hang on, we are riding a strong wave of positive change. Laugh at the things from yesterday and make this a weekend of positive work, where we have magic at our finger tips. 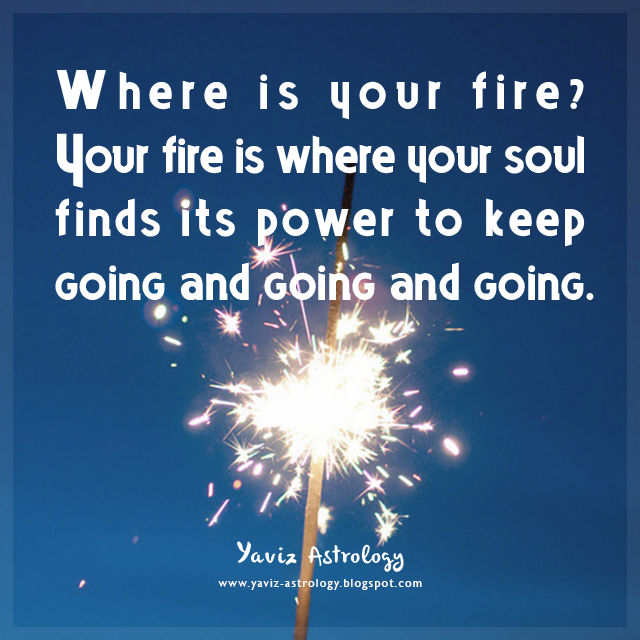 Where is your fire? Your fire is where your soul finds its power to keep going and going and going. We may not always have control over things that are happening outside of us. Things that we wish are not happening to us, but yet they're happening. It may not be so easy in those moments to see the bigger picture, to ponder what lessons we need to learn, or to find hope for a new turnaround. But this is exactly when our power can be reclaimed. The choice to do what we need to do, to think what we want to think, in order for us to grow and move on. It may take us some time, but glimmers of possibility are always there, if we're willing to step away and get back in touch with the core of our emotions, our heart, our light. The Moon is in Leo and forming a conjunction to Jupiter Rx, helping us to concentrate on all the good and have a broadminded approach to life. The key to success at this time will be our optimism and determination. With the Moon's trine to Saturn Rx and to the Sun, Uranus, and Mars, gather those skills and working brain together - this could be our new beginning. Bravery helps us to make a wise decision that can put us in a stronger and more confident frame of mind. Remember that we are a child of destiny, and the more in an alignment we become with what we do, the greater our spirit will be. The Moon is also forming a square to Venus, and we may let off a bit of steam — as it may be the only way that can get us to the truth that we've been looking for. Our common sense plays a big role in feeling our way through certain situations, rather than running away from it every time. Being able to laugh at our own silly quirks can also help lift our energy, and allow us to understand better our desires. As we begin the new week, release any guilt about having fun. Appreciate all that we've done, and let our inner child bloom with joy! The more time you have, the more time you have to think positive. 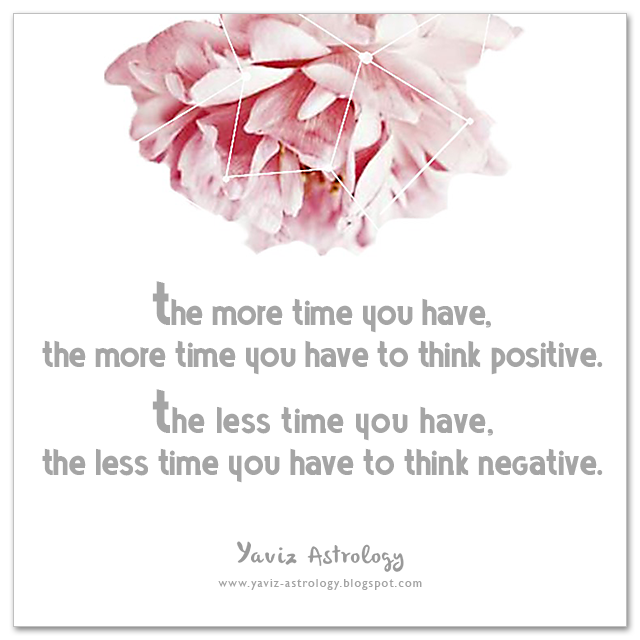 The less time you have, the less time you have to think negative. One of the possible consequences of busyness is having no time for fear. We are so preoccupied with meeting our goals and deadlines, that there is no room left for worries. Some would equate this with being productive, while understandably, others would consider it a problem. But being productive in one area of life, doesn't mean having to neglect the other areas. The same goes with our mind. Focusing on the positives, doesn't mean having to neglect the negatives altogether. It's just that focusing on the positives usually breeds more positive inspirations. While focusing on the negatives, tends to breed more worries. Positive or negative, our mind is always a powerful tool of creativity. By realizing that we have the choice to think what we want to think, to feel what we want to feel, we are already on the way to becoming a more powerful creative force. Someone who can paint a path to walk on — one thought at a time, one feeling at a time, one step at a time. The Moon is in Virgo and forming a trine to Mars and Venus as well as Pluto, guiding us to think of things that can motivate us. This is the right time to steer that ship our way. Good influences make us want to take action and overcome any obstacle along our path with open heart. We are able to read between the lines and our curiosity should lead to some enlightenment. With the Moon's square to Saturn Rx and opposition to Neptune, we may have been feeling a little separated because of long hours of work and we don't like the risk of being seen as someone with no heart or consideration for others. We'll need to rethink certain situations. Do not waste time on the hows. Instead, keep planting the seed of positive change and let our generous and warm spirit shine. The Moon is also forming a quincunx to Mercury, the Sun and Uranus, and we need to escape the confines of our mind. Allow a different conversation to take place with another where we can bring new ideas and solutions to the table. It's just what our mind needs for stimulation at this time - we can be amazed by what we can come up with. The response we feel to someone else's way of thinking maybe like the missing piece to a puzzle. With a Full Moon Lunar Eclipse in Libra approaching in a couple of days, let our sixth sense be our guide. 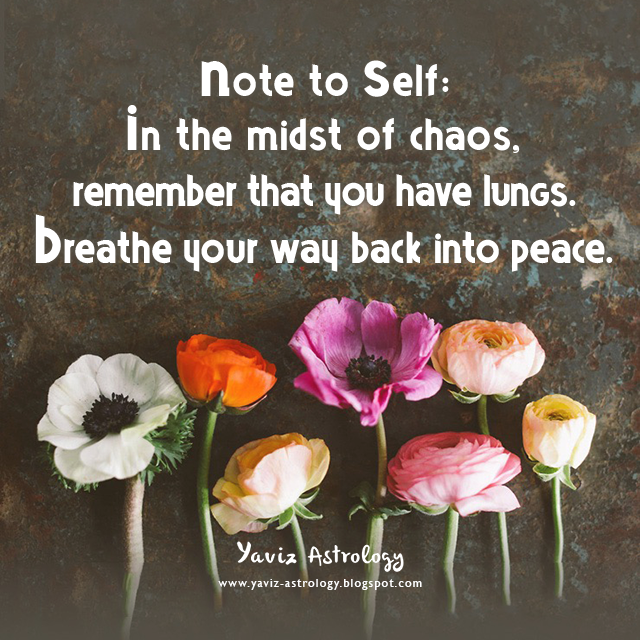 Note to Self: In the midst of chaos, remember that you have lungs. Breathe your way back into peace. There is a difference between breathing unconsciously, and breathing consciously. One is a natural act of survival, while the other, a meditative act. We tend to breathe unsteadily when we are in the midst of stressful situations. Forgetting that we are bringing more tension into our body. Through breathing more consciously, we can regain our peace — which in turn can help us process information better. As we recognize the true meaning of conscious breathing, we make way for our mind and body to retain the balance that they need. Happy Full Moon! The Moon in Libra is opposite the Sun in Aries, marking a Full Moon in the sign of the Balancing Scales. This particular Full Moon also happens to be a Total Lunar Eclipse. And eclipses have a way of bringing things to light. Things that were previously hidden from our view. Bringing us new awareness and insights about our life and those of others. With the Moon forming a sextile to Saturn Rx and Jupiter Rx, we have a natural feel for the work that we do which helps us to accomplish what we set out to do. There are many reasons to be happy as we have far more to gain now than we did before. An idea formed yesterday may bring in the start of something new today. Something not yet visible could be taking shape that can be molded by our creative mind into something good. The Moon is also forming a square to Pluto and an opposition to Mercury and Uranus, and we need to be more alert to those who may abuse our trusting side. Be especially open-minded and refuse to be thrown off balance by the attitude of others. We are well equipped with a passionate understanding to handle anyone that may trap us into doing things we don't want to do. It's a positive outlook that is much needed from us right now. So take full advantage of this Full Moon to understand and express more clearly who we are and what we stand for. Know that we are who we are, because our journey is our story... And our soul, our true guiding light. 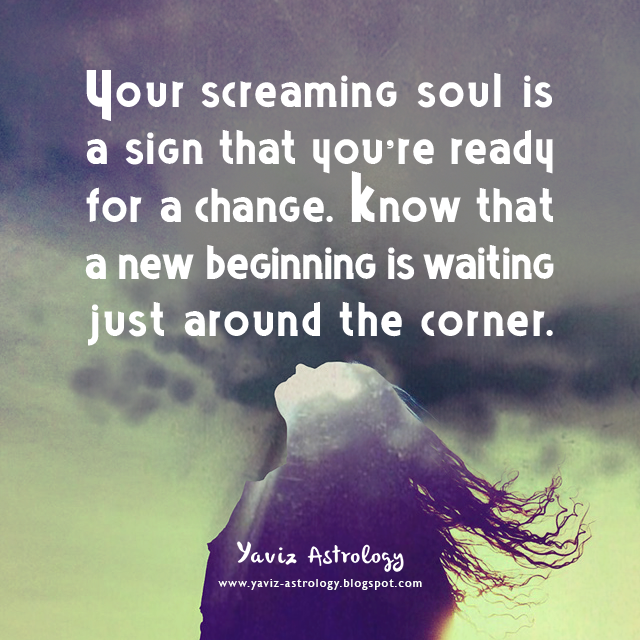 Your screaming soul is a sign that you're ready for a change. Know that a new beginning is waiting just around the corner. Sometimes we learn from our pain, and other times we learn from our joy. Pain brings out the deepest parts of our thoughts, emotions, and feelings - while joy brings to us a sense of elevation, inspiration, and hope. We may not always realize that there's something to be learned from our joyful experiences, but they can serve as a reminder that life goes around in circles. And that nothing is permanent, even our pain. Through pain, we learn the true meaning of anger, hurt, and disappointments. And through joy we can learn that happy times are there to be cherished. As we continue our journey in life, we will see that the more time goes by, the more we will be able to see. Hence the never-ending chance for new understanding, growth, rebirth, and transformation. The Moon in Scorpio is forming a trine to Neptune and a sextile to Pluto, and we will notice and believe in the signs we receive as validation that we are on the right road. There is a new start to our week with an energy encouraging our skills to be put into practice. Spending more time on important subjects will be fun and it may lead to new ideas to work on. We will be in better shape to get through to people on a professional and personal level. Keeping our eyes open to the hidden details around us and learning the art of true diplomacy in the way we ask our questions will serve us well in the long run. With the Moon's opposition to Mars and Venus and the square to Jupiter Rx, emotional tensions may get a bit much at times. Try to find a quiet place, even for a few moments, where we can just let go to revitalize our energy. Avoid any form of power struggle. Simply own our personal power instead, and we won't have to fight for it. Perhaps it's time to learn to accept events as they are, and people the way they are. Or perhaps there are things and events in our life we would rather see gone? Trust that as one door closes, another one opens. That door can be found among the remnants of our old selves. 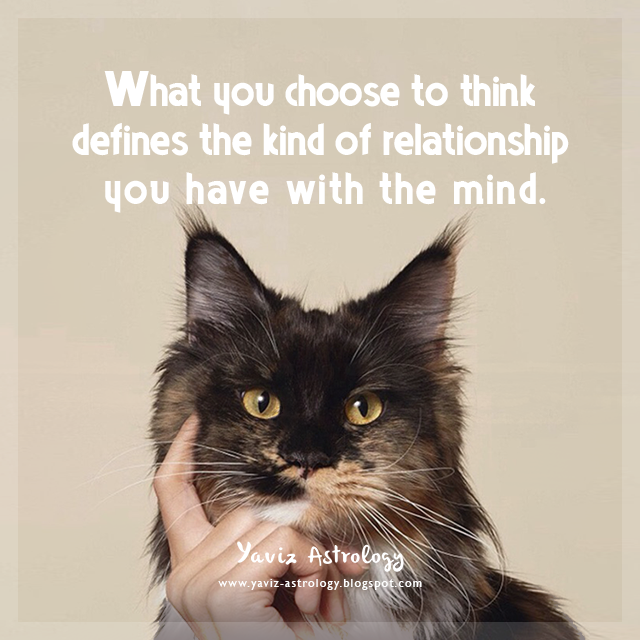 What you choose to think defines the kind of relationship you have with the mind. We can't break up with the mind. But we can break up with our thoughts. What kind of thoughts discourage us? And what kind of thoughts make us feel liberated? The power lies in our heart. How do we want to feel 'deep down'? And how do we want to use our mind? Perhaps it's the realization that we always have within us the capacity to choose what we want to think. Or perhaps it's an inner knowing that our heart holds the answers. It's time to stop the ego from running the show and give the inner mind a chance to inspire. With the Moon forming a trine to Mercury, Uranus, the Sun, and with Jupiter now ending his retrograde phase, we get to choose what kind of thoughts and feelings bring back our fire. Know that as we reaffirm our authentic identity we restore our true innate strength. Let this source of power envelop us with the feeling of freedom to keep us moving forward in the direction of our purpose, goals and dreams. 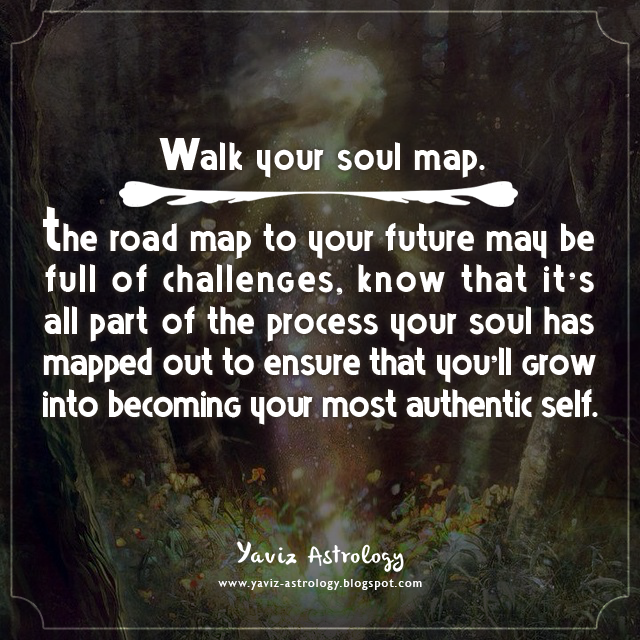 The road map to your future may be full of challenges, know that it's all part of the process your soul has mapped out to ensure that you'll grow into becoming your most authentic self. As we move through the various stages of life, we will see that each lesson brings us closer to understanding more and more who we truly are deep down. And it doesn't matter how long it may take us to get to the finish line, because in the end, there is no finish line — one cycle leads to another cycle, and another, and another. What matters is that we have the power in our present to choose how we want to take that next step. When we want to go forward. And where we can begin to make the necessary changes. Have trust that we are on the right path, even if it feels like we are moving rather slowly. The Moon in Capricorn is forming a sextile to Neptune and a conjunction to Pluto, and we can see the choices available to us to change a situation for the better. Facts and figures feature more prominently in our plans to express what we see in a change we want to make that can lead us to a new direction. We have the nerves of steel at this time to step into difficult circumstances to sort things out. Perhaps we get to see an ability we could put to good use not only for ourself, but also for others. With the Moon's square to Uranus, Mercury, and the Sun, we may see that although we find it enjoyable to be out and about, we could still feel that there is a part missing in our life. Know that there is always a silver lining out there and it just takes our confidence and imagination to come up with a new formula. Let go of our emotional attachments to the outcome, and bring our attention back into the beauty of today. The Moon is also forming a trine to Mars, and our positive thoughts can give extra wings to our actions. This is a great opportunity to get down to business and pleasure. Listen to what our head and heart say to figure out what the stories in our life are trying to tell us. Through being honest now about our thoughts and feelings we could open up a new channel of understanding of each other's needs. Begin to connect more closely with our core inner strength and feel the warmth in our heart blooms as we continue our journey forward in expressing our true soul purpose. Never lose your individuality! 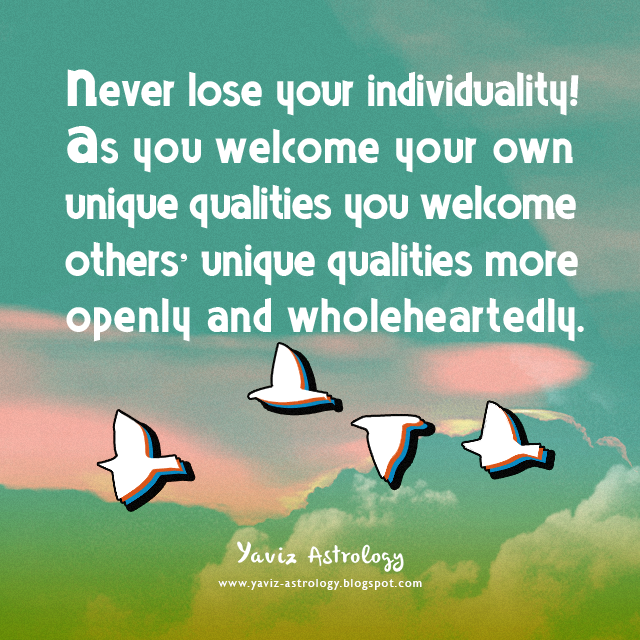 As you welcome your own unique qualities you welcome others' unique qualities more openly and wholeheartedly. Each experience we encounter holds the potential to teach us how to either exercise greater confidence or greater humility. With greater confidence we are able to go for our goals and dreams with stronger determination. And with greater humility we are able to maintain our sense of compassion and humanity in the midst of our disappointments or successes. Through honoring the sacred in every step of the way, we remember that every decision we've made has brought us to where we are today. More learned, more aware, more alive. The Moon in Aquarius is forming a trine to Venus and a sextile to Saturn Rx, Uranus, and the Sun, inspiring us to go out and connect more with different people and experience the wonderful gifts life can give us every day. We know what we want and we focus on going for what we feel is right in our heart. Unexpected ideas could come from others which we can mold to fit in with our own ideas. We will finally find the time to pay more attention to the people that are most important to us. With the Moon's square to Mars and opposition to Jupiter, make sure we are not mixing with the wrong group of people. If we are, then this might be the time for us to move away. There are people more like us waiting to share the same ideas. It is better now to go with the flow and to be more spontaneous as it will energize our ever-growing curiosity. Do not let ourself be dragged into awkward situations as the week begins. Instead, take action and soon we will realize what needs to be done next. Let our determination work with our instincts to discover new ideas and let go of old ideals. There's definitely something to be said now about the magic of positive thinking! 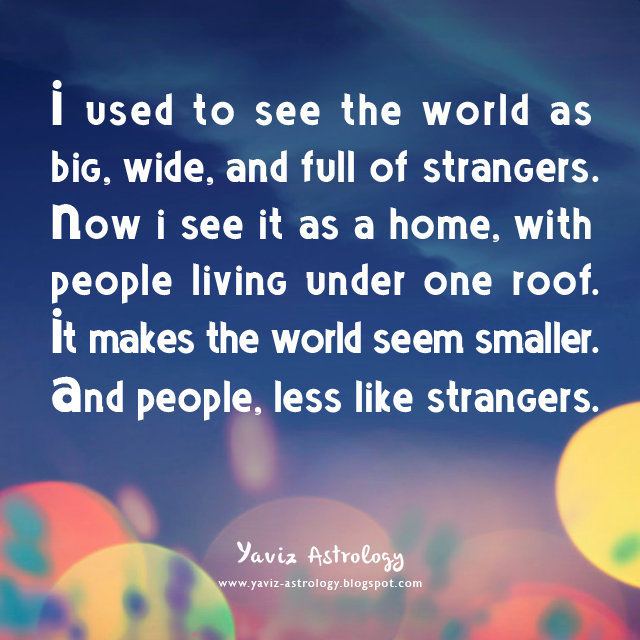 I used to see the world as big, wide and full of strangers. Now I see it as a home, with people living under one roof. It makes the world seem smaller. And people, less like strangers. The way we see the world often determines the way we act in the world. If we see the world as a big and scary place to be, then we will act from our fear-based perspective. But if we see the world as a place where human beings live above the same ground, under the same sky — learning the same sacred lessons, we can become more open towards different people and experiences. By living from the heart, we will be able to keep our common sense and open-mindedness intact as we continue our journey forward. The Moon in Pisces is forming a conjunction to Neptune and a square to Venus and Saturn Rx, and it's good to have our dreams and fantasies - as long as it brings us back to reality feeling more refreshed and inspired. Do not allow anyone to burst our bubble by being negative. Instead, show that we have a powerful tool within us to use our imagination to help us stay our most productive and creative self. Having good communication with a friend can also make it easier to rid us of the anxiety and agitation we feel. With the Moon's sextile to Mercury, Mars and Pluto, we get the confidence and determination to carry our plans through. We have a way with people at this time to catch the hidden meanings behind their words and actions. Enjoy getting to know people who are different and intense in their ways of seeing and enjoying life. Our eyes could be opened to see something more clearly in our everyday life, to live to the full, and to make the most of the good. Let toxic feelings go in exchange for peace. Keep only the lessons and the love, and leave everything else behind. 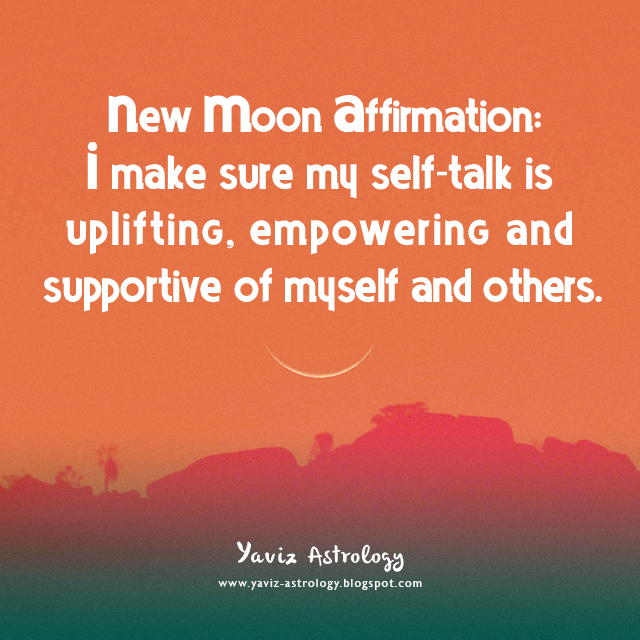 New Moon Affirmation: I make sure my self-talk is uplifting, empowering and supportive of myself and others. The way we talk in our head affects our overall emotional well-being. It can be easy to get caught up in negative self-talk when we feel unclear about our sense of self-worth, or when we go through a painful experience. Why can't we be what we want to be? Or why can't we have what we want to have? Herein lies a chance for us to pause, and to ponder; Why do I want what I want? What's so bad about not getting what I want? Where can I go from here? There's a sense of liberation to be found in knowing that we have the choice to go in whichever direction we want to go to from that point. By recognizing the true power of self-talk, we can begin to speak to ourself in ways that are more healing, strengthening and liberating. Happy New Moon! The Moon is joining Uranus and the Sun in Aries, marking an especially electric New Moon in the sign of the Ram. We have the true spirit of a fighter and our energy is just right to carry anything big or small. It's a time to heal setbacks, and a time to move forward. With the Moon's sextile to Venus and the trine to Saturn Rx and Jupiter, we have an energy that is ready to set us on the right foot with a good approach towards creative projects and career moves. Positive thinking has us on the brink of a new breakthrough, and our heart and courage will carry us forth through to the next stage. The Moon is also forming an opposition to the North Node and a square to Pluto Rx, and our feelings can be quite powerful when it comes to the right and wrong. Instead of trying to win an argument, listen well, trust our instincts and stay authentic. Remove old structures and obstructions, and allow our inner fire to burn brighter. Welcome the New Moon with a new hope, a new dream, and a new sense of direction. Follow the trail. 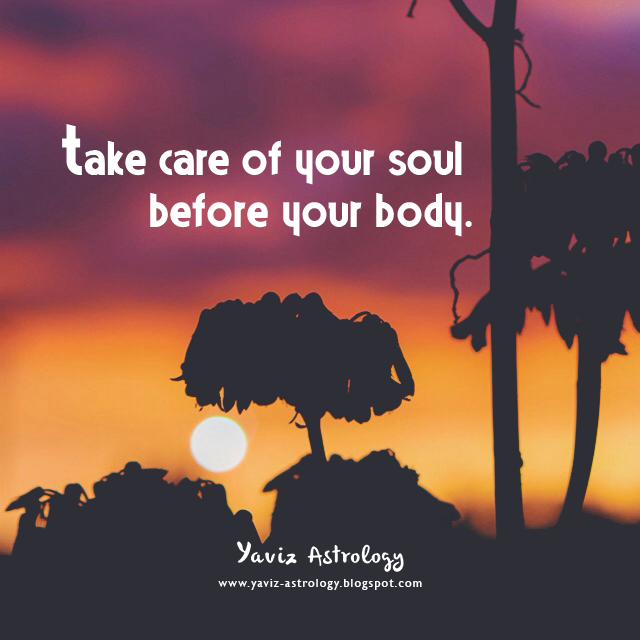 Take care of your soul before your body. It all truly begins within. What we say and what we do is a reflection of what we think and feel. There may be times when it's harder to figure out why we do what we do. Try to look closer in those moments, and we will find that there is always a reason hidden somewhere. That reason could be coming from happiness or sadness. Whatever the reason may be, recognizing it is the first step to finding new awareness. From there we can begin again and move forward in a direction that is filled with new dreams, new hopes, and new solutions. The Moon is in Taurus and conjoining with Mercury and Mars, inspiring us to make a move and keep our brain active. We are longing to get a move on after a period of total silence. Trust our gut feeling, we can make a good choice without rushing into anything. Communication in all areas should be important and uplifting. With the Moon's square to Jupiter, emotions that well up inside could give us the urge to behave rather dramatically. Be more mindful of what we say and do, as we don't want to give off the wrong signals. A good friend or family member will have just the right advice to save us from falling on our face. The Moon is also forming a sextile to Neptune and a trine to Pluto Rx, and ideas that come to us at night or in dreams should be written down. This could get us out of bed with verve and vigor the next morning to take action. We have a new road to look forward to, and our spirit will shine brighter as we make progress towards achieving a goal or a dream. Remember that our past experiences were really opportunities for personal and spiritual growth, and have led us to where we are today. Stronger, enlightened, and on the right path toward a new future — one that is more in alignment with our true values. 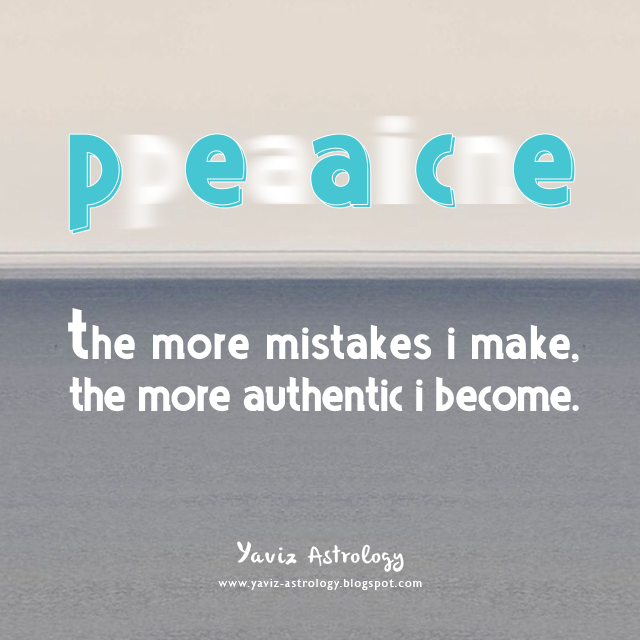 The more mistakes I make, the more authentic I become. There are many types of pain. The pain of being hurt. The pain of hurting. The pain of being lied to. The pain of lying. The pain of being rejected. The pain of rejecting. The pain of hearing hurtful words. The pain of uttering hurtful words. The pain of feeling misunderstood. The pain of misunderstanding. The pain of feeling unloved. The pain of feeling unable to love or express love. The pain of making a mistake. The pain of finding out the truth. Know that any kind of pain opens a window to our soul. To show us who we truly are, and how we truly feel deep down. Through pain, we remove any shadow of untruthfulness to bring in a new layer of awareness — making way for true transformation and genuine growth to take place. The Moon is in Gemini along with Venus forming an opposition to Saturn Rx and a square to Neptune, and it's time to let our intuition free us from whatever is holding us back. Do not stress too much about this week's events. Instead, take advantage of our efficiency to deal with those important documents and emails. Give our focus and instinct some serious attention to help us go forward in the right direction. Trust our gut feeling on this to stay away from old paths. With the Moon's sextile to Jupiter and Uranus, break free and let more of that lively spirit out. Try different ventures and experiences as a way to learn and grow. New sources of information could open our eyes to see ourself as we are and others as they really are. Dig deep into our memories, something may come up that can help us on our way. Perhaps an advice someone gave us a long time ago can put an old situation under a new light. Take a moment to listen to our inner voice and ask ourself; Am I physically ill? Or perhaps I have problems of an emotional nature? Am I ready to embark on a new journey? Or do I persistently fail to find a new path? Help heal our physical, emotional and mental body by releasing the old and embracing the new. It's time we look for happiness inside of us.